Take a leisurely cruise along the waterways of the Pacific Northwest with Queen of the West! Queen of the West is a seasoned sailor on the Columbia and Snake Rivers in Washington and Oregon. Built in 1995, a 2011 refurbishment has kept her in shipshape, adding private balconies, more stateroom options, and a revolutionary, environmentally-friendly propulsion system powered by biodegradable hydraulic oil. Though the refurbishment has brought her up to par with her sister ships in the American Cruise Lines fleet, a traditional atmosphere reigns onboard, and the ship tends to attract a mature passenger base. American-built and American-flagged, Queen of the West offers the perfect way to explore America’s scenic Pacific Northwest. Built like a traditional paddlewheeler, she features a unique onboard ramp that allows passengers to disembark anywhere along the river, just like in the days of yore. Though the onboard activities typically feature low-key activities such as historical lectures, socializing over cocktails, and putting practice, there is one excursion that is sure to get your adrenaline pumping: a jet boat ride through the deepest canyon in the United States! 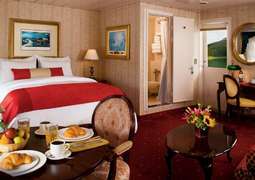 As the oldest and smallest ship from American Cruise Lines, Queen of the West’s staterooms are somewhat more compact compared to those on other river boats. 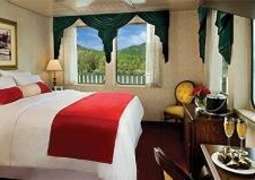 Most staterooms range from 180 to 250 square feet, and some feature a private balcony. Those looking for a little extra leg room may want to book the Owner’s Suite, which features a private balcony, full-size bathroom, and a separate seating area, all spread out over 280 square feet. Most staterooms are also suitable for guests with limited mobility. Dining on the Queen of the West features a mixture of Pacific Northwest specialties and classic dishes. Seafood lovers will delight at the fresh shrimp, salmon, and crab on offer, all locally-sourced. A pre-dinner cocktail hour invites you to taste the local vintage or brew, and presents an opportunity to get to know your fellow passengers. Queen of the West sails the river at a leisurely pace, with a pace onboard to match. Take in the scenery as you sip on a cocktail, practice your putting on a top-deck putting green, or work off your dinner with a few rounds on a stationary bicycle. Acclaimed “riverlorian” Todd Weber will delight with tales of fur traders, explorers, and Native Americans, and different musical ensembles will provide light entertainment in the evenings. The dress code on Queen of the West is resort casual. Passengers are advised to pack waterproof clothes, as summer weather in the Pacific Northwest can be fickle. Most passengers dress up for dinner, though no suit and tie is required: a nice blouse, slacks, or a collared shirt is perfectly acceptable evening attire.